Bonaparte is having a tough time. It's hard for this young skeleton to just hang loose when he can't keep hold of himself. When he plays catch, his throwing arm literally takes a flyer. Eating lunch can be a real jaw-dropping occasion. How can he start school when he has so many screws loose? Luckily, Bonaparte hit the bone-anza when it came to his friends. Franky Stein, Black Widow, and Mummicula all have some boneheaded ideas to help pull him together. But will it be enough to boost his confidence and get him ready for the first day of school? 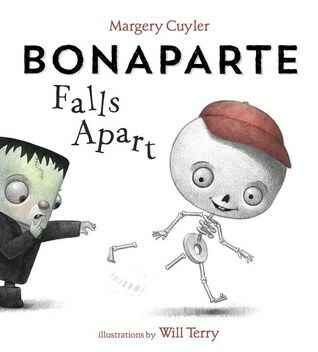 Bonaparte fears going to school when he is constantly losing body parts. A valid fear when you are a skeleton. Bonaparte's friends try to help him come up with a solution, but their efforts fall short. Glue proves to make it hard to move, spider webbing causes great tangling, and mummy wrappings make it hard to see. But when the friends see a dog carrying a bone down the street, a new idea comes to life. This is a cute story about friendship and problem-solving, rather unconventional problem-solving it's true, but for an unconventional problem. The illustrations are fun and appealing. This story works well for a beginning of school story as well as a Halloween story. 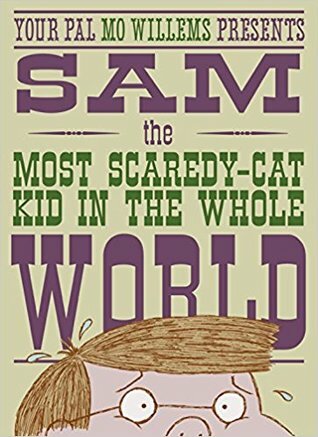 One day Sam, the most scaredy-cat kid in the whole world, makes a terrifying discovery. It's not Frankenthaler the monster. It's her friend-Kerry! Kerry, the second most scaredy-cat kid in the whole world, also makes a terrifying discovery. It's not Leonardo the monster. It's his friend-Sam! Something has to be done. Something BIG. But what? In this adorable follow-up to Leonardo, the Terrible Monster, Sam is the main character. His friendship with Leonardo is intact, but his fears live on. When Sam and Leonardo run into Kerry, the second most scaredy-cat kid in the world and her monster Frankenthaler, terror is the natural result. But Leonardo and Frankenthaler don't have the patience to deal with the problem and leave, requiring Sam and Kerry to face each other alone. In this rather unusual story of friendship, Willems, once again shows it's possible to face our fears and make the best of things. A winning story that many young listeners/readers can relate to, especially the fear of making friends. A shy little ghost who s new to the group has trouble fitting in until his special talent comes to the fore. Boo is new. And even if the other kids are welcoming, it can be scary being new, especially for a shy ghost who can t play any of their games. ("You tagged me? Oh, sorry. I couldn t feel it.") Can Boo find a way to fit in and make friends with the rest of the group? From the creator of Rex Wrecks It! comes a funny story about feeling invisible and finding a way to be seen and appreciated for who you are." Being the new kid can be difficult. Making new friends and finding a way to belong is often difficult. It is for Boo the ghost. Even when he makes friends, he doesn't feel like he quite belongs. He can't play the games the others play. But maybe there is one game that Boo can play with his new friends. Most children feel out of place and like they don't belong at one time or another. 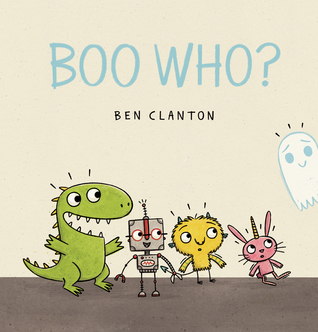 In this sweet story of friendship, a little ghost is different than his new friends. But together they find a way to be friends anyway. 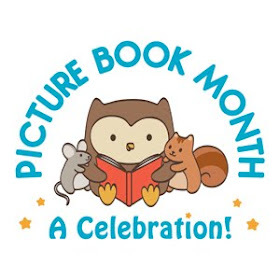 A cute, sweet story that would work well as an introduction to differences and how to work around them for the youngest audience. Pig is thrilled with her costume and how it fits. Pug hates his costume and how cramped he feels inside it. Finally, Pug can't take it any more and sheds the costume. But now Pig is sad because she doesn't have anyone to answer the door with, or trick or treat with, or go to the party with. Can Pug find a solution that makes them both happy? 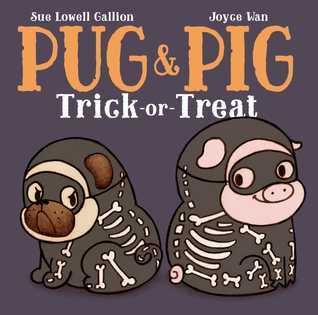 This is a pretty simple story, but that very simpleness is what carries the day as Pug and Pig need to compromise to make themselves both happy. The story is cute, but the message at the heart of it, friendship and adapting to make that friendship work shines through beautifully.